Is your family in jeopardy? Do you lack the communication skills to work through your issues and achieve the peaceful existence that you long for in your home? Family counseling helps family members gain an understanding of the disruptive problems in their family unit in efforts to discover workable solutions. Counseling targets the deficits and arguments within your family in order to improve communication skills. Achieving greater family harmony is only attainable by determining a better way of relating to one another. When walls of resentment are erected and certain touchy subjects are never discussed, then the family begins to drift apart, oftentimes without knowing what has hit them. Family counseling fights against this brewing storm by enabling the various family members to interact with honesty and acceptance and to lessen family habits that cause pain and unhealthy behaviors. Families often come for counseling when they have difficulty resolving an issue. There is that elephant in the room that is just not going away on its own. There has to be work involved in listening to each side of the story and really hearing what is going on from all angles. When there is tension in one or more relationships, then such emotions are controlling the daily interactions among family members. There are also certain life transitions, such as birth, death, marriage, divorce, relocation and retirement, that can deeply impact the whole family. Such transitions are anticipated while others come as a shock. These transitional points in life can either strengthen a family or tear it apart, and it takes a healthy level of communication to process such change in a healthy way. Parenting and step-parenting are a common focus of counseling, as well, because leading a family through perilous circumstances is never easy nor is it the same for all. A counselor might work with an entire family group or some combination of its members. 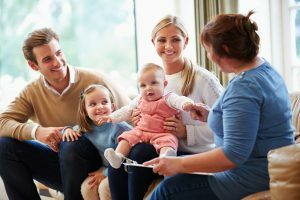 At Stonebriar Counseling Associates, we understand that every family is different, and we strive to treat every family with a unique approach! Contact us today to learn more about our family counseling services.